Email is experiencing a renaissance as retailers recognize that it is no longer a standalone channel, rather a part of a complete retention strategy capable of delivering significant revenue. But the Request for Proposal documents used to select email service providers have lagged behind, and are not equipped to evaluate for innovation or continuous advancement. 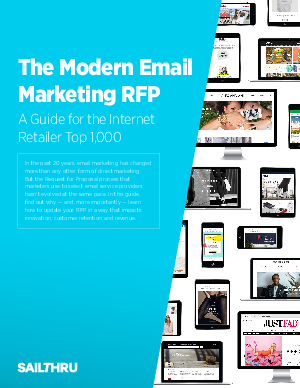 To help retention-focused retailers modernize the RFP approach, our team of retention marketing experts have identified four core areas the email RFP must be overhauled, and included the new, modern questions to use in your own RFP.